Alright, let's get real for a minute. Reality check. 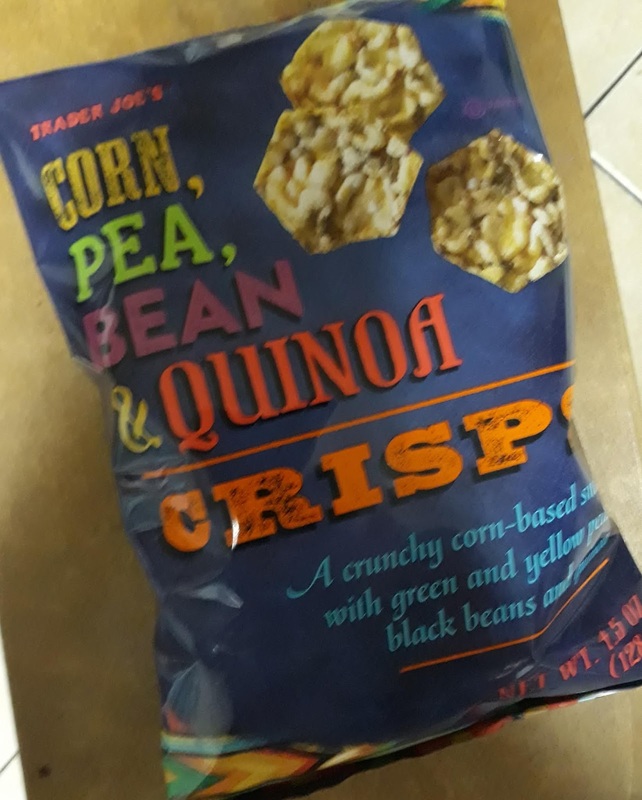 I strongly dislike reviewing items like Trader Joe's Corn, Pea, Bean & Quinoa Crisps. For real, I do. Won't say "hate" but it borders on it for sure. It's not that these crisps taste bad. No, not at all. I swear each main component - green peas, yellow peas, corn, black beans, quinoa - can be tasted individually and yet as part of a bigger whole, like some conglomerated leguminous amalgam in bite-sized six-sided form. Some crisps seem to feature some ingredients more than others, as some have scarcely any peas, others are pocketed with them everywhere like teenaged acne. There's definitely a heavy earthy vibe too, and these buggers are oddly filling. I mean, think of all the fiber. Texturewise, they work too. If you're familiar with PopChips, these are along the same lines as there's an airy, munchy, popcorn chip feel to them. 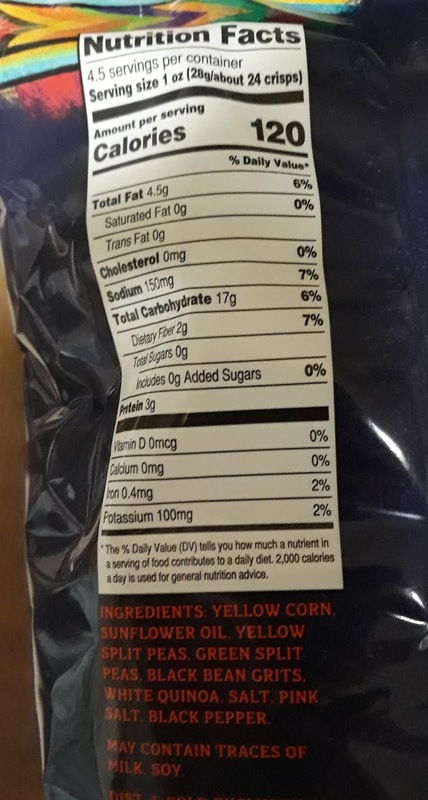 These TJ crisps do seem a little denser - again, consider the fiber - but there's that sensation of light snacking that suddenly gets kinda heavy pretty quick. Of note, the quinoa doesn't stand out much as agrain, in case you were thinking it might be crispy toasted quinoa on here - there's not. And overall it's more of a baked/airpooped feel than fried, as there's not too much grease while having a certain dryness to them. So why the dislike of reviewing such an item? It's hard to make everyone happy. Products like these toe a certain line. It's almost like a John Travolta/Nick Cage-esque "Faceoff" scenario - is it healthy masquerading as junky, or junky actually being healthy? Do they switch back and forth? In truth, as usual, it's probably somewhere in the middle - but some of y'all have pretty strong opinions and if I dare not agree with you - ooooh boy. And then there's the salt. Listen, I love all of you. I do, really. Well, okay, that's mostly true. But love requires honesty, right? Honestly I can't get people who complain about things being too salty when they're not really all that salty. That's just people being salty, not a product. For my day job, I read cardiac patient's medical notes all day, and I can't tell youm how many times a day I read "patient urged to reduce salt intake." I know salt is bad, you don't need to me. I try to limit myself. But I know some of y'all will claim these are too salty. I know you will. Yet...they aren't salty. At all. Sure, there's salt in them, but an identical sized serving of Cheerios or Joe's O's has just as much if not more sodium. No one ever complains about salty breakfast cereal. 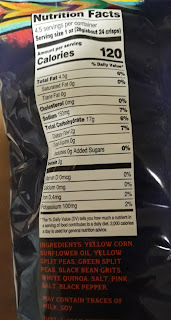 but review chips, even those fairly low in sodium by chip standard? Salt, salt, salt. Hissss. All that being said, good chips, and good for a change up from normal tortilla chips. They'd be awesome with salsa and even better with a little guac - wish I had some here to pair up. Good chips at only like $3 for the bag, and good enough for some double 4's. Well i am a big fan of those popcorner chip things, so i’ll definitely give these a go! Although my favorite popcorners flavor is the kettle corn so hopefully they do a version like that. Aka like the quinoa corn blend ones they used to sell and stopped making last year. these are decent. id give them a 6 or 7.